I achieved another milestone in my Flying Life -- an overnight cross-country trip. My brother is somewhere around year nine of the longest-ever medical school career. He lives in Massachusetts, but one of his rotations recently had him in Chapel Hill, North Carolina. Chapel Hill is far from Massachusetts, but it's only about 225 nautical miles by plane from my home airport in the Washington, DC, area. I found 36 hours with no work commitments and beautiful weather, so I took 35R and headed down to see him. I was a bit nervous setting out on this trip. Earlier in the day, I'd been paying attention to the winds both at my departure airport and in Chapel Hill. It was a beautiful day, but the winds were strong and gusting at right angles to the runway in Chapel Hill. Not only would the ride down have been bumpy, but I might not have been able to safely land the airplane upon arrival. So I waited. And waited. The winds were forecast to die down around dinnertime, and they did. Jodie drove me to the airport and I launched around 6:30 p.m. It was one of the most beautiful flights I've had. There were a few bumps during the first half hour, but as I got further south the bumps faded completely and there was just a beautiful sky. Because of my late start, night fell during my flight. I enjoy flying at night, so I wasn't worried at all. 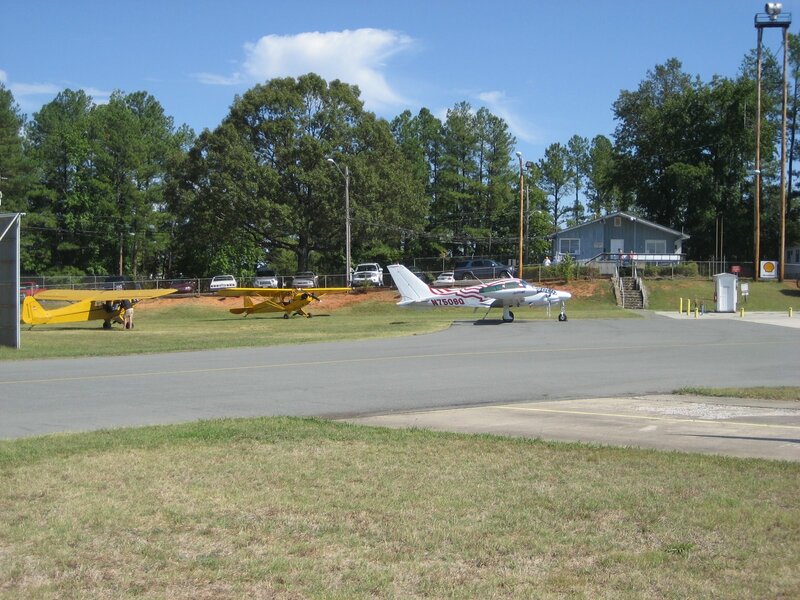 The Chapel Hill airport had runway lights, and the large Raleigh-Durham airport was nearby with multiple large runways if I ever had any trouble. 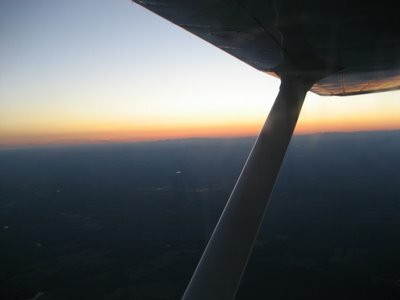 The sunset over the Smoky Mountains was gorgeous off my right wing. I arrived in Chapel Hill a bit after 8:00, having seen the airport beacon from 15 miles away, flashing green and white. The cities of Raleigh and Durham were off to my left as I approached the airport. I clicked the microphone to turn on the runway lights, then announced my intentions over the radio. As I like to do when arriving at a "new" airport, I was going to fly right over the airport to get a look at things, then maneuver to enter the traffic pattern. I flew right over the green-white flashing beacon. But I didn't see any runway lights. I thought I could make out the shape of an airplane on the ground near the beacon, but where was the runway? I circled back and around.... No runway. I triggered the lights and circled again. I checked both GPS maps in the plane -- yes, I was right over the airport, as also confirmed by the flashing beacon on the ground, so where..... Then I saw the runway over my right shoulder. I circled around, but it wasn't there! Then I caught another glimpse of it as I circled. I turned so that I would be parallel to what I had seen, and now I could just barely make it out, but at least I now knew where it was and was roughly in the traffic pattern. I was a little high, so I veered slightly away from the runway to give me a little space on my base leg. When I turned onto base, though, the runway was completely invisible again. Only when I was on final and perfectly lined up with the runway could I see the runway lights again. In my experience, most airports have the runways in relatively wide-open areas, and the lights are visible from a long way away. I think that my problem with Chapel Hill was due to three factors. First, there were tall trees parallel to the runway, which screened the runway lights unless you were looking directly down the runway. Second, the runway lights appeared to be almost bi-directional, so you could see them clearly if you were approaching the runway from one end or the other, but not if you were directly overhead or approaching from the sides. Third, I think the lights were just plain dim, not very bright, and in the midst of a lot of lights on the ground from the nearby Tri-Cities area. Of course, I was also new to the airport, so I didn't have a pattern to look for (other than the shape of a runway near a beacon) and didn't know what to expect. The experience was a bit unnerving, and this might be the last time I fly to an airport for the first time at night. As I taxied back on the runway to the tie-down area, my brother came walking out. He helped me secure the airplane, then we piled in his car and headed to downtown Chapel Hill for dinner. After a good dinner and a night's sorta-sleep (a sleeping pad on a hard floor), my brother and I decided to fly somewhere.... We looked at the charts I had with me and just picked a place: Burlington, North Carolina, about 20 nautical miles West-Northwest of Chapel Hill. My brother David and his wife, Jessica, were my first family passengers, as I wrote before, so Dave had been in a plane with me and knew what to expect. I remembered that he had been a little nervous during the first takeoff roll, so I gave him the headset with my iPod attached. I lined the plane up with the centerline of the runway and asked him if he was ready. He said he was, so I pushed "play" on my iPod and the song "Danger Zone" from the Top Gun soundtrack blasted into my brother's headset as we accelerated down the runway and took off. That was worth a few giggles. The bottom track in the GPS trail above is our flight out to Burlington. We could see the airport from a ways away, and I joined a left cross-wind leg for a landing. We parked the plane and strolled into the FBO. The guy behind the counter greeted us with a smile, and I asked him if there was someplace nearby where we could get a bite to eat. He pretty much tossed me the keys to a crew car -- a car that the FBO keeps handy for airplane crews that need to get somewhere -- and gave us directions to the center of Burlington. It was a Sunday morning, though, and the entire four square blocks of Burlington was closed. We couldn't find a single place to eat that was open, and headed back out of town. Then we lucked out: we saw a very pretty city park with some carnival rides. We parked and got out to explore. There was a town festival going on, and vendors were serving up all sorts of food. We settled for hot dogs and lemonade that we enjoyed while listening to a local country band, then we headed back to the airport, stopping to put some gas in the crew car as a way of showing some appreciation. I had used the GPS to get us to Burlington. David was talking about how cool it would be to get his pilot's license, so I pulled out the chart and showed him how we would use landmarks to navigate back to Chapel Hill by pilotage. It was easy -- we just had to follow I-40, then follow the turn South at a fork as we approached the Raleigh-Durham area. I also offered to show him a short/soft field takeoff. That's a technique where you hold the nose wheel off the ground and get the plane to lift off as soon as possible, even before it reaches flying speed. Then you continue to accelerate close to the ground, then pull up to climb at a relatively steep angle. It's fun to do, and he enjoyed it. The flight back was uneventful, except for a bit of convective turbulence that had us bouncing around a little. There was one jolt in particular where the plane went down and we would have hit our heads on the ceiling but for our seatbelts. 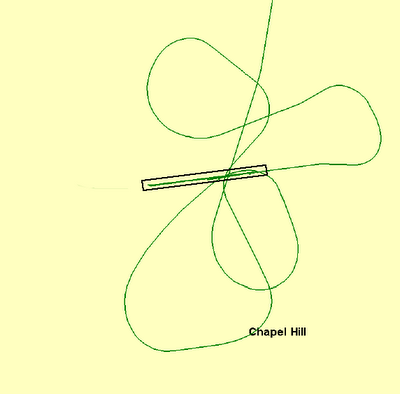 We landed back at Chapel Hill and I saw someone hand-propping an old Piper Cub. I taxied the plane around to the ramp and saw a few more Piper Cubs sitting out. There were a few people sitting on lawn chairs in open hangars, a few other planes out and around, and while I re-packed the plane for my departure, we watched someone take off for a trip around the pattern in yet another Cub. It was the largest concentration of flying Cubs that I've seen anywhere except Oshkosh. David drove me the 5 minutes back to his place to do my flight planning on his computer, as the computer in the FBO was broken. I filed both VFR and DC-ADIZ flight plans, and checked the weather, which appeared perfect. I started the plane as David walked back toward his car. There's a speaker by the FBO that broadcasts calls over the local radio frequency, so as I took off and climbed out, I called over the radio. "Boy, this l'il Cessna really climbs without my lug of a brother in it." A voice came back to tell me that my brother had left and didn't hear the call. I mentally shrugged and turned the plane North. I flew relatively slow for a while due to the turbulence. As it became late afternoon, the air smoothed out and I sped up a bit. 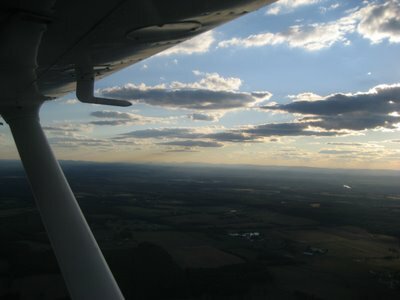 I stopped briefly for fuel in Culpepper, Virginia, then took off for the last leg home. 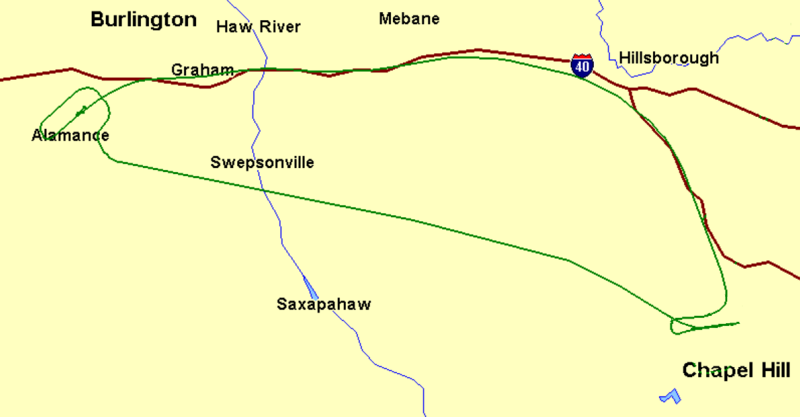 Culpepper is Southwest of Dulles International Airport and the Class B airspace that surrounds Dulles. 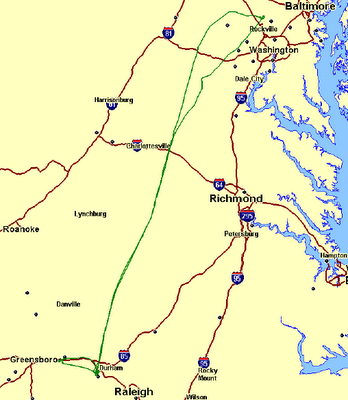 Gaithersburg is on the other, Northeast side of Dulles. I typically cannot fly in Class B airspace without special permission, because of the airliners that are departing and arriving, so I planned to circle all the way around to the Northwest of Dulles, then East by Southeast to get back to Gaithersburg. Leaving Culpepper, I contacted air traffic control to activate my DC-ADIZ flight plan. The controller said, "You're going to Gaithersburg?" I confirmed that this was the case. He said, "Let's see if we can get you up the East side. Stand by." Before long, I was following ATC instructions and flying directly through the Class B airspace over Dulles International Airport. Unfortunately, I had left my camera in David's car, so all I had was my cell phone. 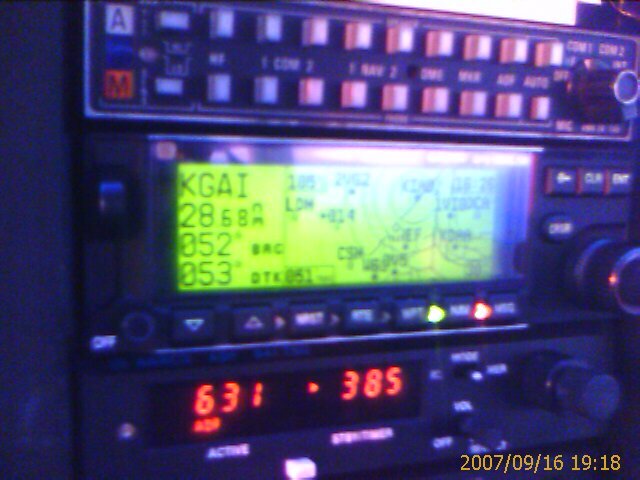 As I approached the airport, air traffic control told me to look for traffic at my 3 o'clock, an Airbus at my altitude. I looked to my right and yes, there was an airbus at my altitude, descending for a landing at Dulles. That was very cool, looking at the business end of an airliner! I flew right over the arrival end of Runways 1L and 1R just as the sun was setting over the mountains to the west. An airliner lined up on Runway 1R and started its takeoff roll as I passed overhead. 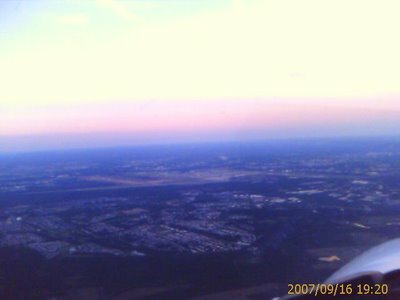 When I was past the airport, ATC cleared me to fly direct to Gaithersburg. I did, overflying the airport, then joining the pattern for a landing in calm winds on Runway 14. Jodie was waiting to welcome me home. All in all it was a very successful flight and a ton of fun. I finally began to understand the allure of a faster airplane, as 110 mph suddenly seemed very slow. "They" say that you learn something on every flight, and I certainly learned a few things on this flight. First, I learned that I don't like arriving at small airports for the first time after dark. I also learned that maybe I can ask air traffic control for clearance through the Class B airspace around Dulles. 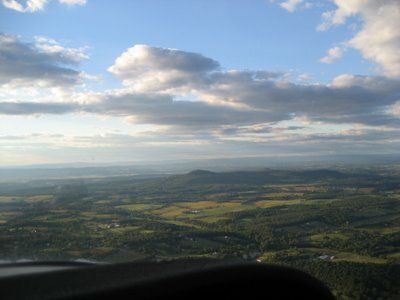 I also learned that flying is a great way to cover longer distances for short visits -- it opens up an entire extended range of day trips, with the added bonus of beautiful scenery along the way. I'm not sure where I'll go next, maybe Massachusetts or Knoxville.... We'll see. My littlest brother, Wes. Considering the ways in which my other brother and I "contributed" to Wesley's childhood, it's remarkable that he's turned out as cool as he is. Surely he would not be such a good guy if David and I hadn't "helped" him build so much character, right? I consider him one of my greatest works. Which also means that I get some credit for the incredible little boy he and my wonderful sister-in-law are raising (and the second one that just arrived). Right? Wesley had waited patiently while I flew with my Nana, mom, and dad. Now that it was his turn, everyone else was tired of waiting and decided to head to a restaurant. And it was getting dark. I enjoy flying at night. The air is often still, smooth, and clearer than during the day, and it can feel like the plane is just suspended above the lights. 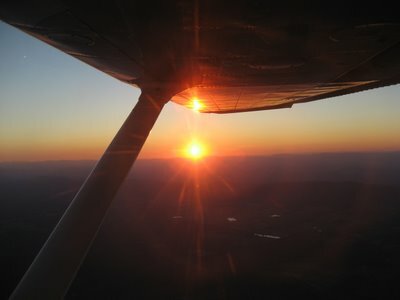 Wes and I took off to fly the "beach tour" that I had done with my Nana and mom, and we got to enjoy the silhouette of the White Mountains to the west, against the remnants of a beautiful sunset. It grew completely dark as we headed down the beach and, since nobody was waiting at the airport for us to return, I continued past Ogunquit down to York. The Nubble Light lighthouse in York is a favorite place for Wes and Brandie. Since long before Emerson was born, Wes and Brandie have loved going to The Bagel Basket in York, then walking along the beach by the lighthouse. They've continued doing this with Emerson, and even now with Owen. The lighthouse no longer casts its light, as I presume sailors can use GPS just like pilots do, and no longer need to be warned of rocks. There is a little red, blinking light on the top of the lighthouse, though, and I flew a circle around it (1,000 feet above) while we looked down on the dim outlines we could make out. I flew back to Sanford and decided to land on Runway 25. Although the wind was relatively calm, and Runway 14 is the preferred runway, Runway 25 is large and has approach lighting -- the "Christmas Tree" that can be seen for miles. Since Wes didn't get to see anything while it was light out, I figured I'd give him the experience of the big runway and all the lights. I triggered the lights as we approached the airport. I showed him how I could turn them down or up, then I set them to high for maximum effect. We landed and taxied back, he helped me push the plane into the hangar and lock it up, and we headed to a restaurant to meet my family. 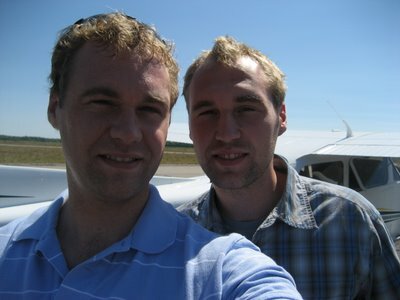 I felt bad about Wes not getting to see much because of the late hour, so I offered to fly him again the next morning. We got a late start, though, and the wind had started to pick up by the time we took off. Wes asked me to explain everything I was doing. I love talking about what I'm doing and why, and I was happy that he was interested. 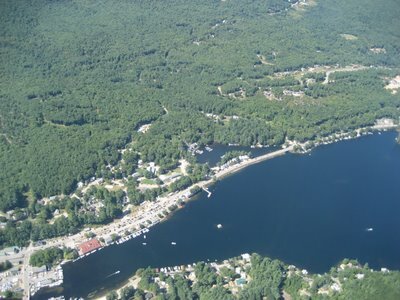 We headed West this time, over toward my parents' cottage on Lake Winnipesaukee in New Hampshire. It's an hour's drive, but only about 25 nautical miles. There were quite a few bumps. I climbed to 4,500 feet in search of smoother air and slowed the plane down to soften the bumps, but it only got a little better. There was also a strong headwind, around 25-30 knots, which slowed our progress. As I approached the area where my parents' cottage is located, I looked at the small mountain ridge just to the West. With the 25-knot wind coming over that ridge, I was hesitant to descend to 1,000 feet above the ground, below the ridge. There was a gap in the hills to the South, which could provide a safe exit without climbing, but I did not want to be caught in the horizontal rotors and downdrafts that can be caused by wind coming over a ridge, so I stayed higher, at least 500 feet above the ridgeline. It was plenty bumpy even at that altitude. Wesley snapped a photo of the area where the cottage is located and we headed back toward Sanford. Even with our airspeed dialed back to soften the turbulence, our groundspeed was around 135 knots. I listened to the automated weather reporting at Sanford as we approached the airport. The wind was from 250 degrees at 11 knots, gusting to 19 knots. I explained to Wes that the wind was right down Runway 25, which was good, but that I would keep our approach speed a little higher to compensate for the gusts. 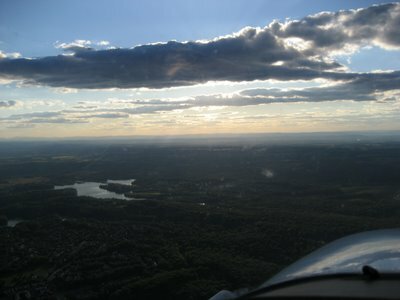 It was really quite bumpy in the traffic pattern, and the wind gusts kept me busy with the yoke -- as I turned onto our base leg, a gust tipped the plane to about 60 degrees. Fortunately, I was keeping our airspeed higher than I normally would, to give me better control authority, and I quickly corrected without losing any significant amount of altitude. The approach was a little tense, though, and Wes later did a very funny impression of me with my right hand "white-knuckled on the throttle," and my left hand on the yoke in seizure-like motion. 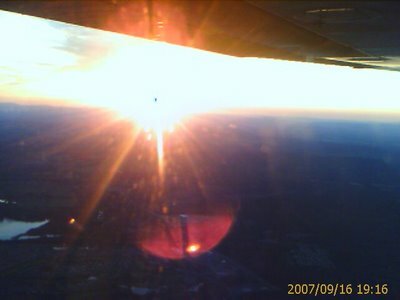 We crossed the fence at 70 knots and I held the plane in the roundout for a while before flaring. Surprisingly, the touchdown was baby soft. I was "white-knuckled on the throttle," prepared for the gusts to balloon or drop us, but neither happened and there was hardly a bump as the wheels touched down. Nevertheless, as we taxied back to the FBO there was plenty of humor about airing out the cockpit, cleaning the seats, etc. Other family members had arrived after breakfast, waiting for possible rides, but I wasn't about to take them up. It was not unsafe to fly in that wind, but operations close to the ground were a little squirrelly. I would go do pattern work in that weather just for the practice, but it wouldn't have been fun for them or me to go out just for a fun, scenic flight. I forgot to have Wes sign my logbook, but maybe he'll drop a comment here. 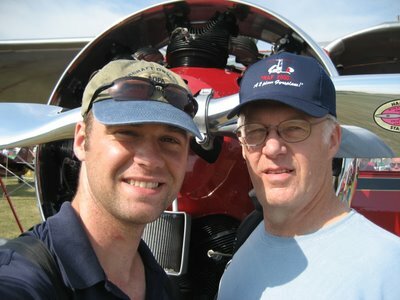 I loved flying with him, both times, and look forward to more of it. 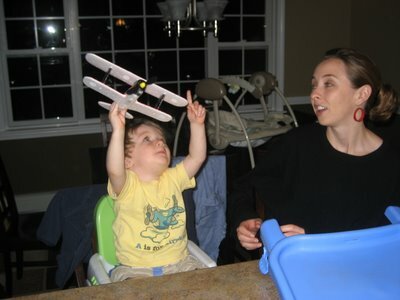 His son's interest in flying is infectious, I think, and may have infected Wes. I suspect that, given the opportunity, he'll end up a pilot himself. When I landed, returning my mom to terra firma, I finally flew with my dad! My dad and airplanes. 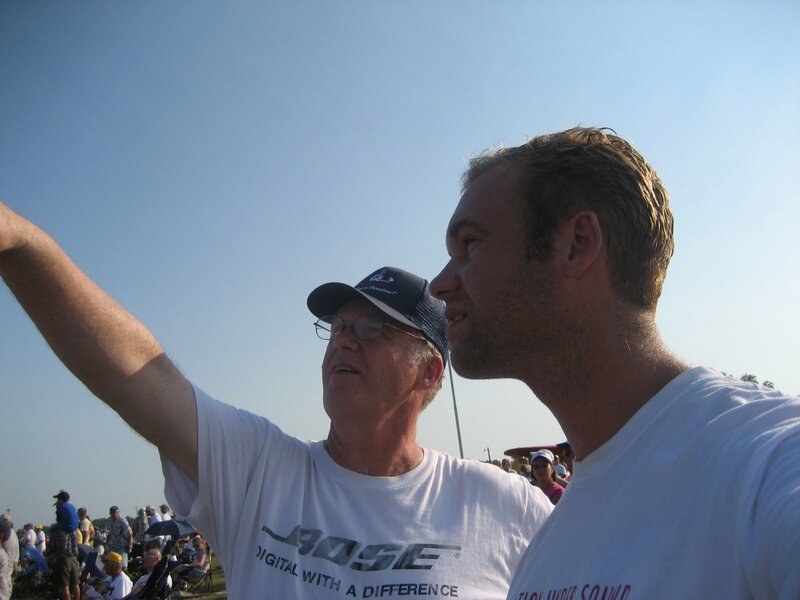 Airplanes and my dad. My dad is not a pilot, but he has been talking about airplanes my whole life. 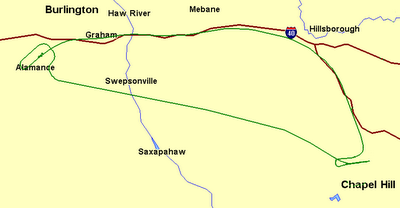 There's the story of a neighbor in rural Charlestown, New Hampshire, where he grew up. 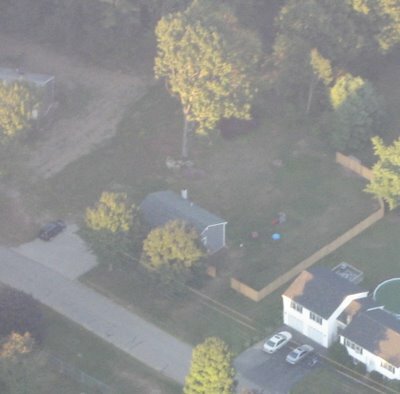 That neighbor flew an airplane out of a backyard strip. Then there was the guy who built an airplane in his garage and couldn't fit it out through the door after the wings were installed. My dad was working on airplane radar when he was 18 and in the Navy. For most of my life, he was in the Air National Guard and then the Air Force Reserves out of the now-defunct Pease Air Force Base in Newington, New Hampshire. KC-135s and F-111s flew out of there, and old bombers were set up as static displays near the entrance to the base. We would go to air shows and special events for the families of the soldiers, often walking around various airplanes and talking about how cool they were. I remember being in the back of our old station wagon on Interstate 95 at night, driving past the end of Pease's runway and seeing fighters take off overhead, twin tails of sharpened flame stretching from their afterburners. Or meeting my dad at the Newington Mall on one of his duty weekends, and hearing the periodic thunder of KC-135s doing touch 'n gos over at the base. That's how I learned what a "touch 'n go" is -- my dad told me as we listened to the big planes do it at his air base. Then the wind tunnel.... My dad explained Bernoulli's principle to me and helped me build a wind tunnel out of wood and glass. We went to the dump (remember those?) and found an old metal fan that we put at one end. I made a wing out of balsa, laminated it with plastic wrap and scotch tape, and we made it fly. I think there are a lot of people like my dad, who love airplanes and flying, but just haven't ever done it. The money and time and responsibilities of raising a family, following the contours of a career, and caring for a house, barn, various pets, and a stable of cars, tractors, and boys.... Time goes by. We walked for miles, looking at all of the airplanes tied down around the airport and ogling some of the beautiful restorations. We watched the airshows every day we were there. 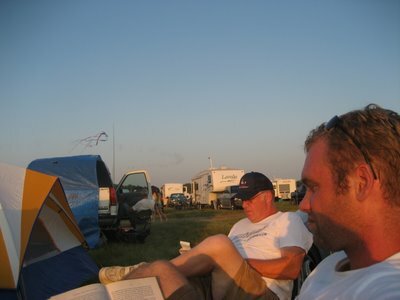 And we relaxed by our tents every evening in Camp Scholler, enjoying our books and the comfort of my camp chairs. Behind it all was the theme of what I was going to do when I finally had my license, and what he could do if he got his. 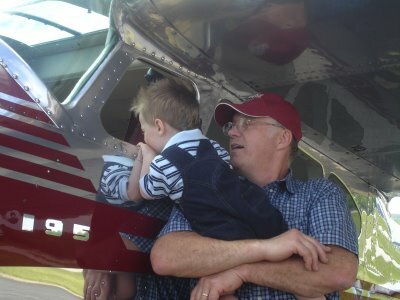 Somehow I'm not surprised that my dad has shown up in so many photos of my young nephew Emerson falling in love with airplanes. I think I have vague memories of him lifting me up to look in airplanes thirty or so years ago. So my dad was one of the first people I wanted to take flying. But months went by. 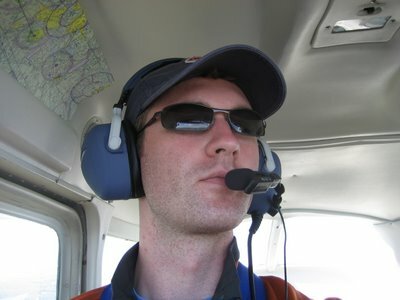 It took me a few months after my checkride before we even got into the same state. Then there were other obligations and just not enough time to get to the airport, checked out in a rental, etc. Short of coming down to Maryland and parking himself on my couch until I took him flying, there's not much more my dad could have done to get into the air. We've come close, as I've written before, but it just never worked out. So it was with a LOT of anticipation that I walked up to my dad at the fence after flying my mom around the beach. I briefed him, making sure he knew how to latch and unlatch the seatbelt and door, the climbed in. I told him about the flights I'd taken with my Nana and mom, and asked if he'd like to do the same or head inland. He didn't really have a preference, so I figured we'd head inland toward lake country. I talked through my runup so he could follow along, asked him if he was ready, and we rolled down Runway 14. I climbed higher as we headed toward my parents' cottage in New Hampshire about 30 NM away. There were some hills at about 2,300 feet, so I climbed to 4,500 as we headed West. It was beautiful. The sun was low, the air was clear, and there was no turbulence. Surprisingly, though, there WAS a significant headwind of 20-30 knots. 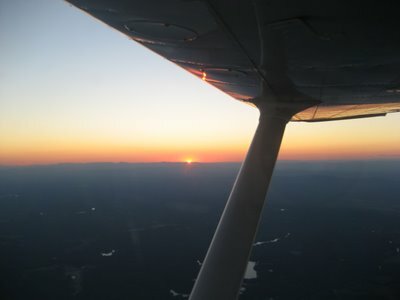 As the duration of our flight to the cottage grew longer, and looking at the lowering sun, thinking of the people still on the ground hoping for a ride, I decided that we didn't have time to go all the way to the cottage. I explained the situation to him and asked if he minded if we headed back to the airport. Other than asking a few questions, he had been pretty quiet the whole flight. I had done most of the talking, prattling on about the different instrument indications, what I was doing, things we were seeing, and so on. He said he wouldn't mind if we turned back, so we did. 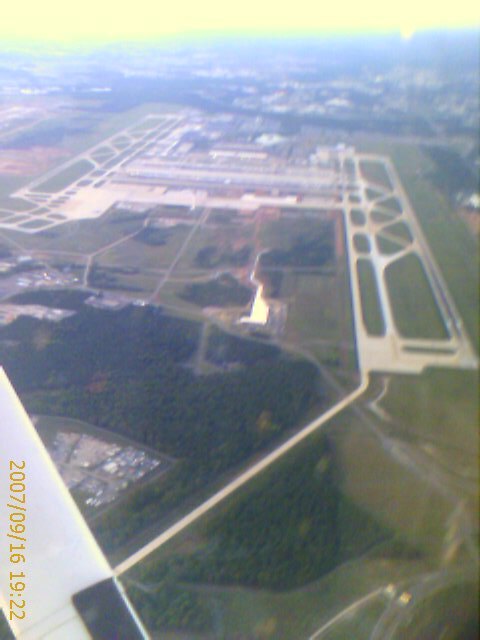 I was high as we approached the airport, and on the wrong side of the runway, so I announced that we would overfly the airport 1,000 feet above pattern altitude. As we approached the airport, I flashed my taxi and landing lights at the small group of family on the ground, then I circled around and we entered the pattern to land. Since he had been so quiet, I hadn't bothered to give him my usual spiel about avoiding non-essential conversation during the landing phase of flight. As I was about to turn base, he asked a question. I gave him a quick answer, then asked him to hold other questions until we were on the ground. There was a light crosswind, but I turned in another great landing. "Flying like clouds, floating like a feather, and just as smooth! "Here are your wings. Love, Mom." My mom was waiting at the airport fence when I landed from flying with my Nana. She seemed a tad nervous, maybe just excited, as we walked out to the plane together. 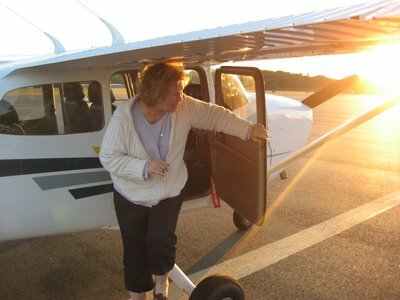 I showed her how to use the seatbelts and how to lock and open the door, then I walked around the plane and got in. A few minutes later we rolled down Runway 14 and climbed toward the ocean. "Wow, it's really right there!" she said. With nearly unlimited visibility, an object the size of the Atlantic ocean appears "right there" from less than 10 miles away at 1,200 feet. 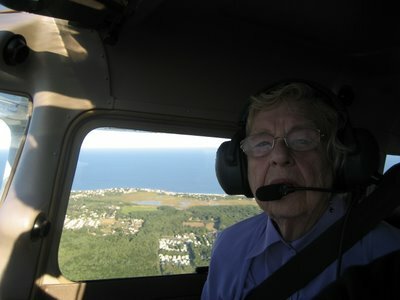 I repeated the flight I had done with my grandmother, accelerating to 120 knots at 1,200 feet, then slowing to 80 knots at 1,000 feet as we flew South along the beach from Wells to Ogunquit. 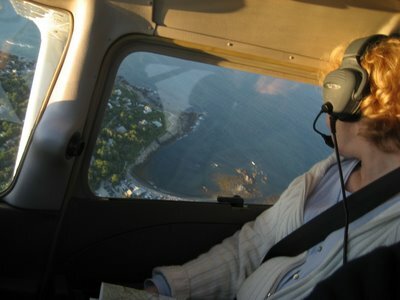 I turned right to head Northwest when we were over Perkins Cove in Ogunquit, catching this photo of my mom as I did so. She didn't seem in the least discomforted by the bank angle. As we headed Northwest, she was looking at the instrument panel and at the ground for landmarks. We were a couple miles inland when she picked out my brother's house among the trees. I circled around twice while she snapped photos through the window. We continued on toward the airport, looking for my parents' house where I grew up. 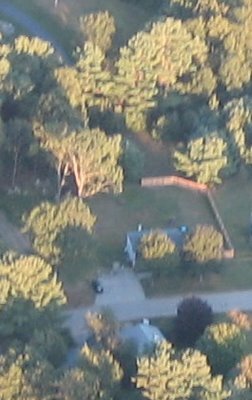 The house is only 3 miles from the airport, so I was a bit nervous to be maneuvering at a low, pattern altitude. I announced our position relative to the airport on the CTAF and only circled once. It's a very pretty house in a beautiful setting. We returned to the airport and I performed my second near-flawless landing of the day. My mom climbed out of the airplane all smiles. "The York County (Maine) fly-over produced vivid sensations & images - all of them great - that continue to swirl through my mind. 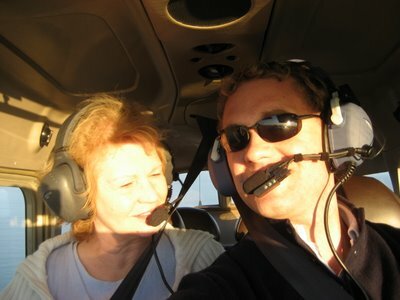 The pilot, who happens to be my son, was considerate & excellent. 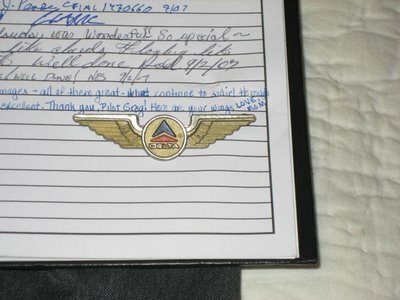 Thank you, Pilot Greg! Here are your wings. Love, Mom." Pinned to the page was a set of gold plastic wings with the Delta Airlines insignia. You see, in 1979, for my sixth birthday, my parents gave me my first flight in an airplane. My cousin, Janet, and I were put all alone on a Delta flight from Portland, Maine, to Bangor, Maine. It's only 100 nautical miles from Portland to Bangor, and the flight lasted all of 20 minutes. But we were aloft, alone, I looked down on houses and hills for the first time, and it was a major highlight of my life to that point. The stewardess gave each of us these gold, plastic wings. According to my mom, who held onto them for the last 28 years, I've now earned those wings. And that feels very good. 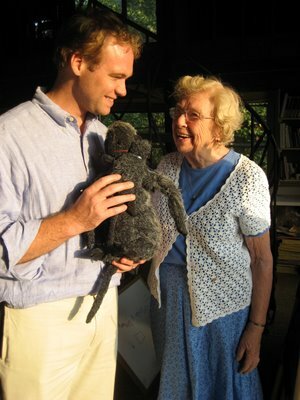 When I arrived in Maine on the Saturday before Labor Day, I found my grandmother at my parents' house. My grandmother is a remarkable woman, fearless, energetic, funny, creative, a brilliant conversationalist. When I brought up the idea of going flying the next day, she was first in line. About thirty years ago, my uncle got his pilot's license and flew for a while. He gave it up not long after he got his license, though I don't know why. My grandmother had flown with my uncle, though the only story she's told me is the one about how my uncle couldn't find the airport to land. She also got caught once in a storm on one of Maine's islands and was flown to the mainland in the mail plane, but that was at least 15 years ago. So while flying in a small plane was not exactly new to her, it had been a while. She and I drove to the airport ahead of everyone else and I checked out a newer 172SP. 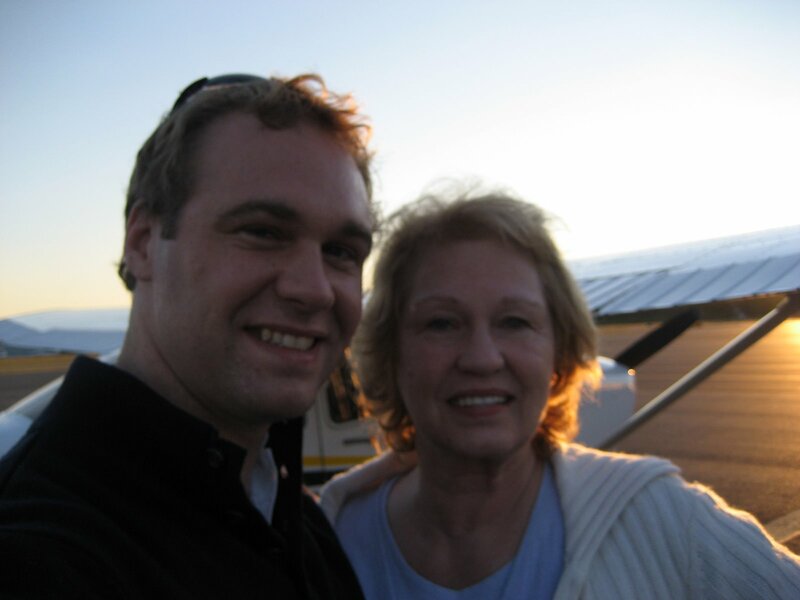 I did a thorough preflight and gave my grandmother a good preflight briefing. Before long, we were at the end of Runway 14, ready to go. I asked her if she was ready, and she said she was, so I pushed in the throttle and we began rolling. Engine gauges looked good, power good, airspeed alive, twenty knots, thirty, forty knots, fifty..... We were just shy of rotation speed when my grandmother decided to adjust her position in her seat. Looking for something to pull herself up with, she grabbed . . . the yoke. And pulled. "DON'TTOUCHTHAT! DON'T . . . TOUCH . . . THAT!" I yelled through the intercom, pushing against the yoke as she pulled. She let go, and two seconds later we passed rotation speed and were climbing away from the airport. She hadn't yet said anything in response to my shrieking. "I thought this was a collaborative venture," she finally said, and I burst out laughing. She was obviously chagrined, and I still feel awful for yelling at my Nana, of all people, but it was a dangerous situation. If I hadn't had the presence of mind to push on the yoke as she pulled, it might have been a very short flight with a bad landing. My passenger briefings now include detailed and explicit instructions/reminders on what parts of the plane should not be touched. 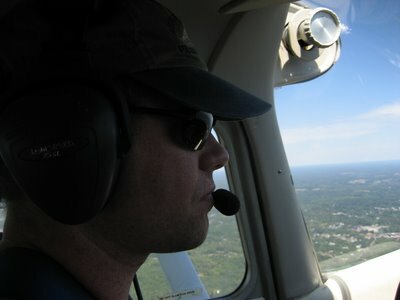 I levelled off at 1,200 feet, about 1,000 feet above the ground, and let the plane accelerate to 120 knots or so. There was absolutely no turbulence. We flew 10 miles East to the coast, just South of the prohibited airspace around the elder President Bush's place in Kennebunkport, then turned South. I kept the plane at 1,000 feet and slowed to 80 knots, flying about 1/4-mile off the coast so my grandmother could see the beaches from her window. 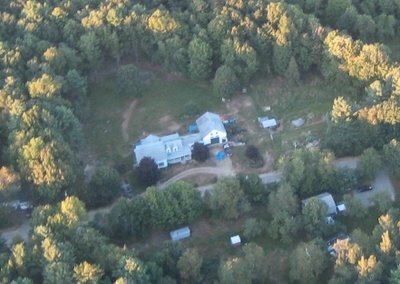 We flew South to Ogunquit, then I climbed to 2,000 feet and turned Northwest to head back to the airport, snapping this picture as we went. There was a 5-knot crosswind as I landed on Runway 14, but my landing was about as perfect as they come. When I taxied back, I saw the rest of my family that had arrived and was waiting on the other side of the fence. They had all seen my good landing! I stopped the plane, shut down, and my grandmother said, "Well!" 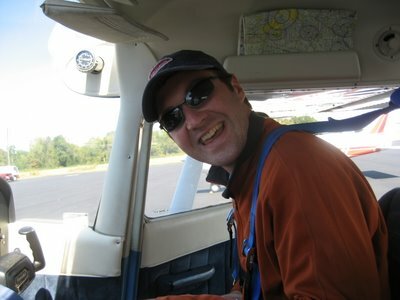 "Greg, soaring with you in the clouds was wonderful. So special. Love, Nana." I was in Maine this past week. The trip had originally been planned as a trip to Boston for work-related stuff, and I scheduled a little vacation around those days. Then my work commitment was cancelled. Since my in-laws were now planning to fly to Maine for part of the week, I decided to add a couple days to my vacation and stay for the whole week. It was a great time, in no small part because of the flying I got to do. 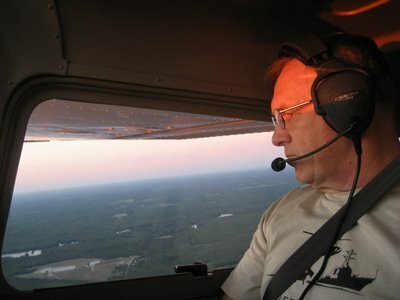 I previously wrote about the beautiful clear skies I saw in Maine, as well as my attempts to take my dad flying. This time it all came together. I reserved a plane for a 4-hour block on Sunday evening, from 5 to 9. Once it became known that I was giving rides, my family members literally lined up at the airport fence. The weather was absolutely perfect. Nice and cool, in the 60s, with tremendous visibility, no turbulence, and only the lightest winds on the ground. There wasn't a single cloud in the sky.